As workplaces have evolved, so have the workforces that use them. Several distinct worker personas have emerged, each with its own demands for specific hardware, software and services. We think it’s time your customers knew more about them. Dell EMC is committed to helping businesses maximize the potential of their employees via the technology they use. And because we can offer more personalized products to suit a range of in- and out-of-office environments, that potential is more achievable than ever. So, with that in mind, let’s review two of our fastest growing personas that work outside the office: remote workers and “on-the-go pros”. Each requires different solutions to achieve its potential. It’s not difficult to imagine where you’d find a remote worker: anywhere but the office. They might operate at home, abroad or in a local café. The range of devices they use is as broad as the number of locations they work from. They need technology that can keep up with their pace. 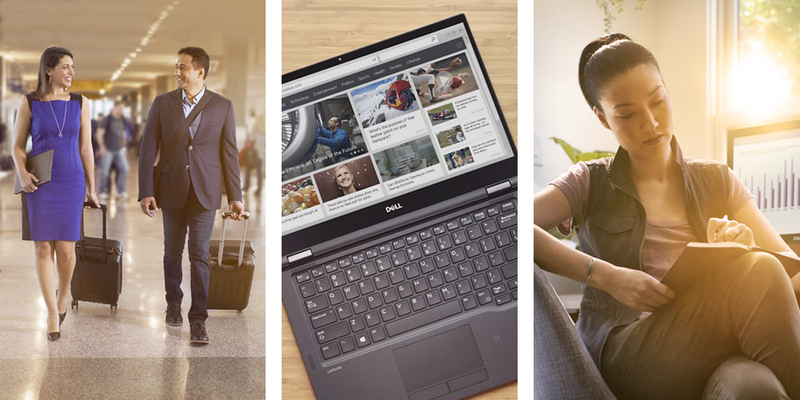 The Dell Latitude range fits the bill. It has powerful notebooks with essential features. The mainstream 5000 Series offers high performance, and the premium 7000 Series is the ultimate portable solution because of its long battery life. And they’re all designed to run Microsoft Windows 10 Pro. But the remote worker’s home-office experience is also critical. Dell Wyse thin clients or Dell OptiPlex desktops can provide a fully managed desktop experience and can be supplied as a complete solution via the Dell VDI Complete service. Their home becomes their home office. 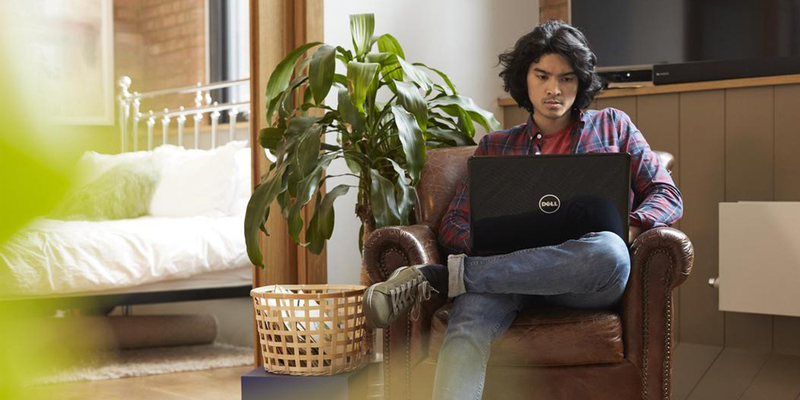 Check out the remote worker guide to learn how The University of Massachusetts manages its own out-of-office student network with vLabs, its VDI infrastructure. Because on-the-go pros spend most of their time out of the office, one of your customers’ key concerns for these employees is security. With Dell EMC, you can enable these employees to succeed, safe in the knowledge their devices and data are secure. These users need efficient but feature-rich experiences, and nothing beats the mobile device. 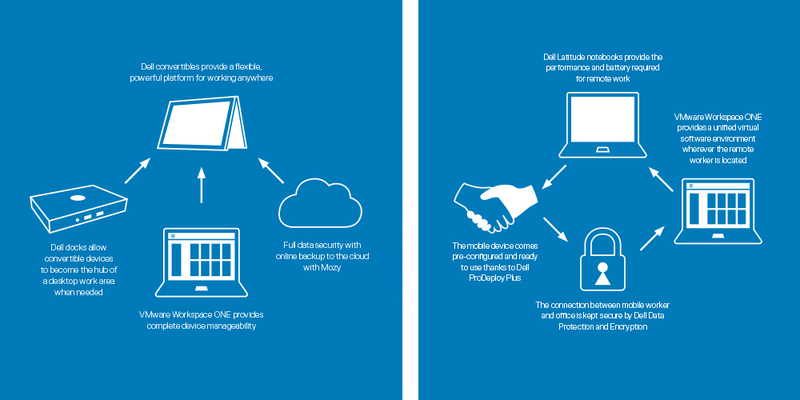 The Latitude 2-in-1 range offers Windows 10 with built-in security. VMware Workspace ONE can be layered on top of an on-premises server provision as well as via the public cloud. Either option satisfies the user’s need to have the same access wherever they are while offering robust security. What’s more, RSA’s NetWitness Suite provides immediate detection and response to any threat, anywhere. ecosystem. Read about their solution in the on-the-go pro guide. Technology has a huge potential to help organizations transform their workplaces, and by extension, transform their people’s working lives. We believe that approaching workers as personas is a critical part of workplace transformation, providing personalized products for how employees work today and in the future. We’ll take care of the solutions, so you can take care of your customers. Read the On-the-Go Pro and Remote Worker guides, as well as others, here. We’ve also created related emails here, on our new Digital Marketing Platform so that your marketing teams can quickly get these guides into the hands of your customers. The guides explain how to maximize the productivity of their employees through the right choices from our end-to-end portfolio.